Hadhrat Imām Qāsim ibn Muhammad ibn Abū Bakr as-Siddīq (24-107 AH), radiyAllāhu anhum ajma’īn, was one of the greatest Tābi’īn and one of the great seven jurists of Madinah. He was grandson of Amīr al-Mu’minīn Abū Bakr as-Siddīq radiyAllāhu anhu, and nephew of Umm al-Mu’mineen Sayyida Āishā Siddīqā raziyAllahu anhā. He married his cousin Asmā bint Abdur-Rahmān ibn Abū Bakr as-Siddīq radiyAllāhu anhum. 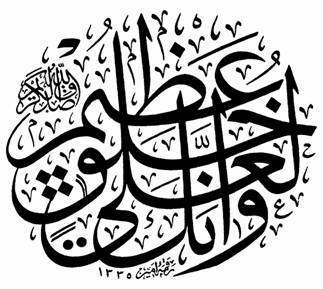 They had a daughter named Fātimā, also called Umm Farwā, who was married to Imām Muhammad al-Bāqir bin Imām Zain al-Ābidīn. She was also the mother of Imām Ja’far as-Sādiq, who received the secret of the Naqshbandi way from his grandfather Imām Qāsim. Hazrat Qasim b. Muhammad is among the hadith transmitters who is reliable and trustworthy in the eyes of both Shia and Sunni scholars. In most tarajim (biography books) and rijal books of both schools, he has been admired by kind descriptions. In his Sahih, al-Bukhari has introduced him the most knowledgeable man of his time. Muhammad b. Sa’d, the author of Tabaqat al-kubra, quotes from Muhammad b. ‘Umar al-Waqidi and introduces Qasim b. Muhammad as a great, trustworthy and pious faqih. Ibn Hibban, Ibn Khallakan, Ibn Hajar and some other Sunni scholars have mentioned similar descriptions about Qasim b. Muhammad in their books. These expressions suggest the credit of Qasim b. Muhammad before Sunni scholars. He was one of the seven most famous jurists in Madinat al-Munawwara. It was through these seven great Imams that hadith, fiqh(jurisprudence) and tafsir (exegesis) of the Qur’an were disseminated to the people. His mother was the daughter of the last king of Persia, Yazdagir. His grandfather was the first khalif, Abu Bakr as-Siddiq. He met some of the Tabi`in, such as Salim bin `Abdullah ibn `Umar . Sufyan said, “Some people came to al-Qassim with sadaqa (a donation) which he distributed. After he distributed it he went to pray. While he was praying the people began to speak negatively about him. His son said to them, ‘You are speaking behind the back of a man who distributed your sadaqa and didn’t take one dirham from it for himself.’ Quickly his father scolded him saying, ‘Don’t speak, but keep quiet.’ He wanted to teach his son not to defend him, as his only desire was to please Allah and he had no concern for the opinion of people. He died in a place between Makkah and Madinah called al-Qudayd in the year 108 (or 109) H. while he was on pilgrimage. He was seventy years old at the time of his passing. Al-Qassim passed the Secret of the Golden Chain to his successor, his grandson, the Imam Ja’far as-Sadiq . Qasim ibn Muhammad ibn Abu Bakr as-Siddiq ² was one of the seven most famous jurists in Madinah, being the most knowledgeable among them. When he approached death it is related that the Kabah said, “O Qasim! I am going to miss you and I am not going to see you again in this dunya.” Then the Kabah made five hundred circumambulations around Qasim out of respect for him. You belong to created beings. Created beings belong to you. Shaykh Qasim ibn Muhammad ibn Abu Bakr as-Siddiq ² descended from Abu Bakr as-Siddiq on his father’s side and from Ali ibn Abi Talib t on his mother’s side. He was born on a Thursday, in the holy month of Ramadan. The first answer to that supplication and the first one to receive that blessing was Sayyidina Qasim (as). In his time he was known in Madina as Abu Muhammad. People came to listen to his guidance, his lectures (suhbah) and his disclosures of the hidden meanings of the Quran. Qasim ibn Muhammad ibn Abu Bakr as-Siddiq was one of the seven most famous jurists in Madinah, being the most knowledgeable among them. It was through these seven great Imams that the Traditions, early jurisprudence, and Quranic commentaries were disseminated to the people. He met some of the Successors of the Companions, including Salim ibn Abd Allah ibn Umar ².
Sufyan said, “Some people came to al-Qasim with charity which he distributed. After he distributed it, he went to pray. While he was praying, the people began to speak negatively about him. His son said to them, ‘You are speaking behind the back of a man who distributed your charity and did not take one dirham from it for himself.’ Quickly his father scolded him saying, ‘Do not speak, but keep quiet.’” He wanted to teach his son not to defend him, as his only desire was to please God. He had no concern for the opinion of people. The year in which Abu Muhammad Qasim (as) was to leave this world, he set out on the pilgrimage on the third of Ramadan. When he arrived at al-Qudayd, where pilgrims usually sojourn, God opened to his vision to behold angels descending from heaven and ascending in countless numbers. They would come down, visit the place, and then go back up. And while he watched these angels carrying the blessings with which God was sending them, it was as if that light and concentrated power was being poured into his heart directly, filling it with sincerity and God-consciousness. Qasim (as) immediately opened his eyes and saw his grandfather before him. He said, “I just saw you in a dream.” Abu Bakr as-Siddiq replied, “Yes, I was ordered to meet you.” “That means I am about to leave this world,” said Qasim (as). “Yes, you are going to leave the world and accompany us to the hereafter,” said our master Abu Bakr as-Siddiq . Then Abu Bakr t disappeared and Qasim (as) began dhikr on his tongue and in his heart. He continued his journey to Makkah where he stayed until the time of Hajj. Then he witnessed the standing at Arafah (which occurs each year on the 9th of Dhul-Hijja). In that year many saints, both men and women, were spiritually present at Arafah, and Qasim bin Muhammad bin Abu Bakr as-Siddiq (ra) met with them. Abu Bakr appeared to them spiritually saying, “That crying from every point on this earth is because you are leaving this worldly life, as I informed you on your pilgrimage.” Then Qasim (as) raised his hands and prayed to God, “Since I am passing away from this life now, forgive whoever stood with me on Mount Arafah.” Then they heard a voice saying, “For your sake, God has forgiven whoever stood with you on Mount Arafah on this Hajj.” At that moment God revealed to Qasim’s heart unlimited Gnostic knowledge. At that moment Qasimt left Mount Arafah and arrived at Makkah al-Mukarrama, at the Kabah . There he heard the sound of crying coming from the House of God and it kept increasing as he approached, until everyone could hear it. That was the voice of the Kabah, crying for the passing of Qasim (as) from this world. 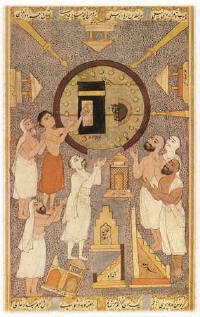 At the same time a flood of tears poured forth from the Kabah, flooding the entire area with water. The House of God said, “O Qasim! I am going to miss you for I will never again see you in this world.” Then the House of God made five hundred circumambulations around Qasim (as) out of respect for him. Then Qasim (as) said farewell to the Hajar al-Aswad (Black Stone), then to Jannat al-Mualla, the cemetery in which Khadija al-Kubra , first wife of the Prophet (s), is buried, and then to all of Makkah. He then left and went to al-Qudayd, a place between Makkah and Madinah, on the 9th of Muharram , where he passed on to the next life. The year was 108 (or 109) AH/726 CE, and he was seventy years old. He passed the secret of the Naqshbandi Golden Chain to his successor, his grandson, Imam Jafar as-Sadiq (as). 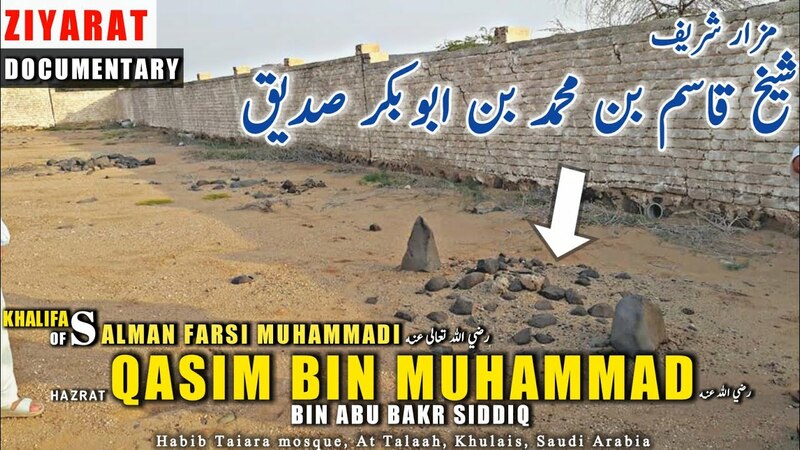 Al Qasim ibn Muhammad was the grandson of Abu Bakr as-Siddiq (may Allah be pleased with him). He was born in the 30th year after the hijrah, which corresponds to the year 650 AD. He is the cousin of Zayn al-Abideen, the great-grandson of the Messenger of Allah (peace and blessings be upon him). Ja’far as-Sadiq is the grandson of Qasim ibn Muhammad.